Featuring Ten Time Grammy Winner Arturo Sandoval and the culinary artistry of Blue LLama Executive Chef Louis Goral. Join Blue LLama Jazz Club’s pre launch event at Zingerman’s Greyline for The Rebirth of the Cool: Jazz Gala & Benefit, an evening dedicated to celebrating and elevating jazz music in Ann Arbor. Enjoy a tasting of world-class cuisine from Blue LLama Executive Chef Louis Goral. Learn about and support the efforts of music organizations that work to inspire the next generation of musicians in Ann Arbor and nationwide. Experience an intimate performance and conversation with jazz legend Arturo Sandoval. 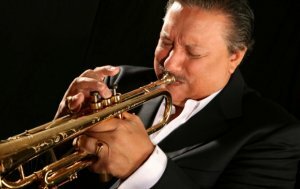 A protégé of the legendary jazz master Dizzy Gillespie, Arturo Sandoval was born in Artemisa, a small town in the outskirts of Havana, Cuba, on November 6, 1949, just two years after Gillespie became the first musician to bring Latin influences into American Jazz. Arturo began studying classical trumpet at the age of twelve, but it didn’t take him long to catch the excitement of the jazz world. He has since evolved into one of the world’s most acknowledged guardians of jazz trumpet and flugelhorn, as well as a renowned classical artist, pianist and composer. He desires nothing more than to share his gift with others who feel the same intense adoration for music as he does. Executive Chef Louis Goral will prepare a preview of the Blue LLama Jazz Club’s culinary offerings, featuring gourmet shareables inspired by jazz music and his own culinary journey. Chef Louis is thrilled to bring his experience to the Blue LLama Jazz Club after executing critically acclaimed cuisine in Philadelphia, Chicago, Washington D.C. and New York. A2 Jazz Fest, Vincent York’s Jazzistry and the Arturo Sandoval Institute will showcase the work they’re doing to elevate music and inspire young musicians. Additionally, Blue LLama Jazz Club will match donations to each organization, dollar-for-dollar for up to $15,000. General Admission: $100. Service fees apply.